Does your jaw feel stiff or do you have difficulty opening your mouth wide? Do your jaw muscles feel tired in the morning? If so, you may grind your teeth at night, a medical condition called Bruxism. Or you may just be clenching your teeth, which can be just as harmful. People with nighttime grinding habits may wear away their tooth enamel “ten-times faster” than those without “abusive chewing habits.” Eventually, your teeth may be worn down and destroyed. In addition to relieving head, neck, jaw, and shoulder pain, treating Bruxism and clenching is cost-effective compared to ignoring the condition and exposing teeth to continued grinding. Without treatment, crowns, bridges, implants, and dentures are often needed to repair or replace worn and damaged teeth. 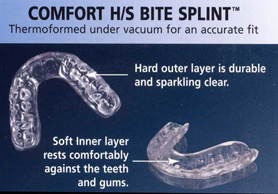 Ask Dr. Collins today if a night guard can help to provide temporary relief from grinding, bruxing, or clenching.